Estonian-Danish trio The Dynamite Vikings (Jaak Sooäär on guitar, Thommy Anderrson on double bass and Karsten Mathiesen on drums) shows, that the classic power trio format still allows for expression that may not be new given the earlier jazz/avant/prog/improv-rock traditions, but is still interesting and vital. As a live band they're rather impressive. 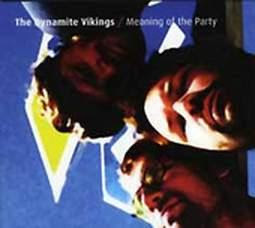 On Meaning of the Party, their third record The Vikings have managed to capture the rawer and rockier aspects of their sounds, while somewhat lacking in live energy and spontaneity. The closest it gets to rocking out is the title track, that includes, in addition to heavier-than-usual guitar, some rather Christian Vander-ish drumming from the eccentric Mathiesen. The most interesting pieces are the last two long compositions with ambient leanings, totaling 16 minutes together. For those interested in this band, I wholeheartedly recommend, in addition to the record, to go see them live.